LAKEVILLE, Conn. – The Ford GT has now made the podium at every race it’s attempted – globally – since Laguna Seca in May. 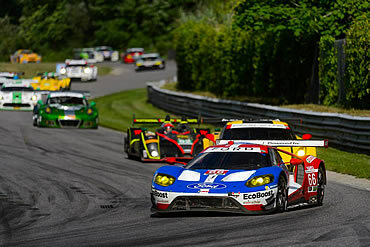 Co-drivers Richard Westbrook and Ryan Briscoe were a threat to win the Northeast Grand Prix at Lime Rock Park late in the race, but drove the No. 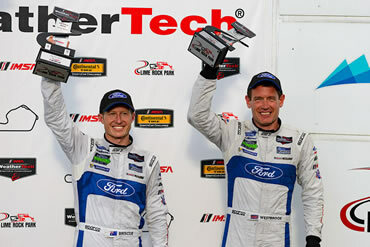 67 to a third-place finish to extend Ford Chip Ganassi Racing’s global podium streak to six. Its sister car, the No. 66, finished a hard-fought fifth in GTLM thanks to drivers Joey Hand and Dirk Müller. Westbrook and Briscoe’s win at Laguna Seca, the first win for the new Ford GT, kicked off a streak of three victories in a row for the No. 67 IMSA team, who also won at Watkins Glen and Canadian Tire Motorsport Park before finishing third at Lime Rock. In the meantime, the No. 66 IMSA car won the GTE Pro category at the Le Mans 24 Hours right after the No. 67 FIA WEC Ford GT finished second at Spa. The WEC team continues its season Sunday at the 6 Hours of Nürburgring (Germany). Westbrook proved a quick study, qualifying p1 for the race on Friday. It was his second pole and the third pole overall for Ford GT (Le Mans, Watkins Glen, Lime Rock). The No. 66, which finished where it started at p5, struggled from the start due to contact with another car. The IMSA team continues its season at Road America August 5-7.